• Studio – Of all of our patio rooms, this style is one of the most versatile, since it is compatible with one-wall, two-wall, and three-wall setups. • Conservatory – With a European influence and a design available in a squared or faced version, this sunroom is sure to impress. • California – This enclosure is perfect for those who have a multi-story home. 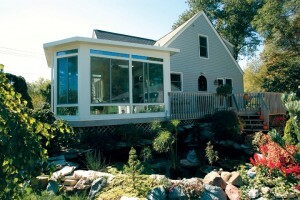 • Solarium – For homeowners who desire an all-glass ceiling and full glass windows, this is the sunroom for you. • Cathedral – This style patio room includes beautiful vaulted ceilings that will make your space feel roomier than ever. • Walls-only – If you have an existing patio, you can have our installation specialists install premium glass panels to transform your porch into a sophisticated-looking sunroom. To learn more about top-of-the-line patio rooms we offer, contact U.S. Patio Systems and Home Remodeling today.